This next installment of “If Walls Could Talk” will be the Petworth watering hole, The Looking Glass Lounge. This is one of my favorite places for a Sunday afternoon beer, especially in the warmer months, out on their back patio. I imagine the place will be packed this evening, and now you guys have another interesting conversation topic … what’s the story of the building inside which you’re drinking beer? 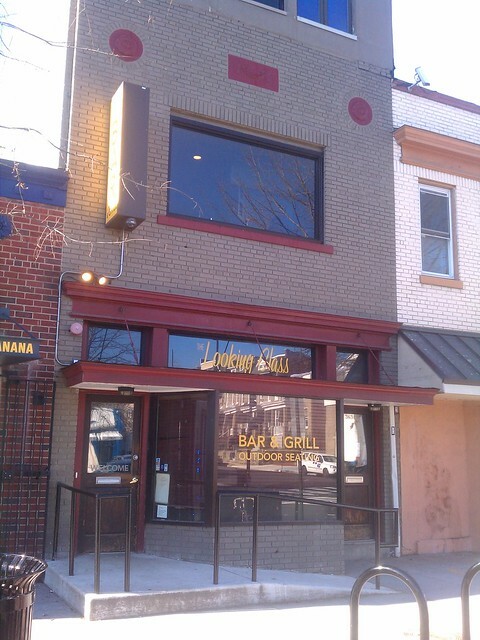 So, let’s look into the history of the building at 3634 Georgia Ave. NW. I should also add that two businesses occupy the top floor of the building — Fission Strategy and Big Window Labs. The first thing I came across is the listing of a building permit in the November 18th, 1928 Washington Post. Dominic Polnerendo applied to build a two-story front brick addition for 3634 Georgia Ave. NW with the estimated cost of $3,350. That’s a fair bit of money for the time. Full homes would sell for about $5,000 to $6,000 at the time. On November 2nd, 1949, Judge Henry A. Schweinhaut presided as 34 people were sworn in as American citizens at the District Court. In this group was Frank Weltlinger of 3634 Georgia Ave., who was an immigrant from Hungary. Eleven years later, poor Frank (63) and his wife Marie (64) were attacked and robbed by two men and a woman. The Post reported in April of 1960 that they were closing up their market at 3rd and Q St. NW when the mugging happened. The Weltlingers had to go to the hospital, but the injuries were minor. By that time, they were living way up Georgia Ave., in Silver Spring. Seven persons were hurt early yesterday in a two-car collision at 12th and K sts. nw. Investigators identified the drivers as Walter J. Dymek, 32, of 1305 N. Herndon st., Arlington, and taxicab driver Vincent E. Hawkins, 50, of 408 M st. se. Hawkins, they said, was admitted to Emergency Hospital in serious condition with a fractured neck and head cuts. Others listed as Emergency patients were Maxine Shafer, 26, of 1664 Columbia road nw., a passenger in the private car, fractured left leg, and Woodrow W. Williams, 39, of Georgia ave. nw., a passenger in the taxicab, head injury. Treated at Emergency, police said, were Dymek, Edythe Murdock, 40, of 1664 Columbia road nw., and Spikes Haronis, 30, listed at 1614 N. Danville st., Arlington, both passengers in Dymek’s car, and Williams, wife, wife Pearl, 36 a passenger in the cab. The first thing I’d like to point out is that there is a passenger named Spikes Haronis. What a name! Second, I will not make any snide comments about Virginia drivers in the District. Maybe I’ll cut them some slack because the other car was a taxi … not exactly known for stellar, safe driving habits. I was able to track down a U.S. Census record for Woodrow in 1920. He was 7 years old and was living with his family at 1526 34th St. NW, in Georgetown. I’m sure the he’s be shocked to hear that the home is now worth $1.3 million (thanks Zillow). His father, Joseph Williams, was a sergeant in the Washington Police Department. Maybe he knew everyone’s favorite policeman, Officer Sprinkle. Woodrow is listed in an article about the Thanksgiving meal served in 1941 at Ft. Belvoir. It states that he was being chosen for induction into the military (Pearl Harbor and the U.S. involvement in World War II is still weeks away). The best part of the article is where they talk about the menu. A letter was received at The Post yesterday written on the back of a Thanksgiving Day menu which evidently inspired Private First Class Joseph E. Marcus stationed at Fort Belvoir, Va., to poetic ecstasy. Lovingly he called attention to the “shrimp cocktail, sage dressing, giblet gravy, mince pie and cocoanut [sic] layer cake,” among the list of items on the menu which, of course, centered around the traditional roast turkey. “Won’t Hitler be mad when he sees what our boys are eating,” wrote Private Marcus concluding his letter. I found another article, this time from May 29th, 1945, which listed Woodrow Williams as one of 22 District residents who were ordered to report for induction into the armed forced. Lucky for Woodrow, World War II would be over in about two month. But also odd, since the previous article mentioned he was inducted in 1941. Either he slipped through that first time, or maybe this would be a second tour of duty. I found the small advertisement below in the March 23rd, 1927 newspaper. BARBER-First class: good guarantee and commission. Apply 3634 Georgia ave. nw. Interesting. I guess there used to be a barber shop in the building. The help wanted section on April 17th, 1940 had a listing for male painters and paperhangers. The advertisement said to call at 7 a.m. by showing up at 3634 Georgia Ave. I’m curious whether this was a request to help paint the building or because the person living there had a painting business. Another curiosity was right below it, looking for an experienced presser to apply at Walker & Co., which was located at 2317 18th St. NW — the current location of Brass Monkey. NW-3634 Georgia Ave. Lge. 6 bed rm. home, oil heat, ref. required. Rent $195. per mo. EX 3-0303. Holy cheap, right? Well, it was 1965. In the March 26th, 1986 Washington Post, an announcement listed 3634 Georgia Ave. NW as up for sale by the trustees. Below is what was in the paper. TRUSTEES SALE of Valuable store known as premises 3634 Georgia Ave. N.W., Wash. DC. By virtue of a deed of trust duly recorded February 1, 1985, Instrument #04096 and in accordance with Public Law 90-566 noticed [sic] filed February 12, 1986, the undersigned Trustees will offer for sale Lot 131 in Square 2897 at 1:00 PM Friday March, 21, 1986 in the office of the Auctioneer. TERMS OF SALE: ALL CASH Sold subject to prior deed of trust, further particulars of which to be announced at time of sale. Settlement 30 days. A deposit of $2,500.00 cash or certified check to be made at time of sale. All other terms and conditions to be announced at time of sale. I’m guessing that the owner of the building passed away, and as a result, the property was to be sold at auction. So, when you’re knocking back that Old Fashioned, PBR (read this post about the beer) or Dogfish Head, think about these stories in conversations with the bartenders and your buddies. Don’t forget to tip your bartenders! Here’s a great indoor shot I found on their website (sorry I took it without permission, but I’m hoping it’s cool since I’m writing this post). UPDATE: Reader Kent from Park View emailed to tell me that, technically, The Looking Glass Lounge is in Park View … Which is correct. So make sure you correct your buddies tonight when they ask to meet in Petworth.